Many businesses with expertise in refurbishing equipment are scouring the country for salvage equipment pieces with the intent to resell them. Aside from the obvious financial benefits associated with refurbishing and selling a piece that would otherwise have no value, the salvager saves these pieces from rotting into oblivion in a storage or salvage yard. There are many websites whereby a person willing to try their hand at machinery resale can procure salvage equipment. Salvage sale is an online auction site for salvage equipment operating under the umbrella of Ritchie Brothers auctions. Machinery zone and Equipment Trader also have sections of their online machinery inventory reserved specifically for salvage machinery. Regardless of where one makes the purchase, a very crucial aspect of this process is getting the purchased machine from where it currently sits, inoperable, to where it needs to be (your warehouse/shop). 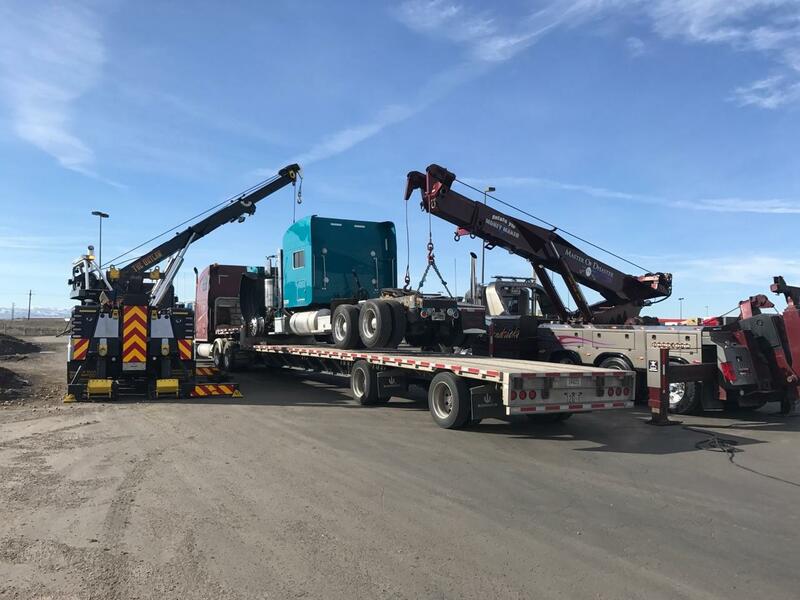 This process may include hiring a rigger or a wrecker to load the salvage equipment on the truck trailer, securing it for safe transport, transporting it safely and finally, hiring a rigger or wrecker to offload. As a freight broker with extensive experience in transporting salvage equipment with open-deck trailers, Interstate 48 Transportation is your go-to company in this regard. 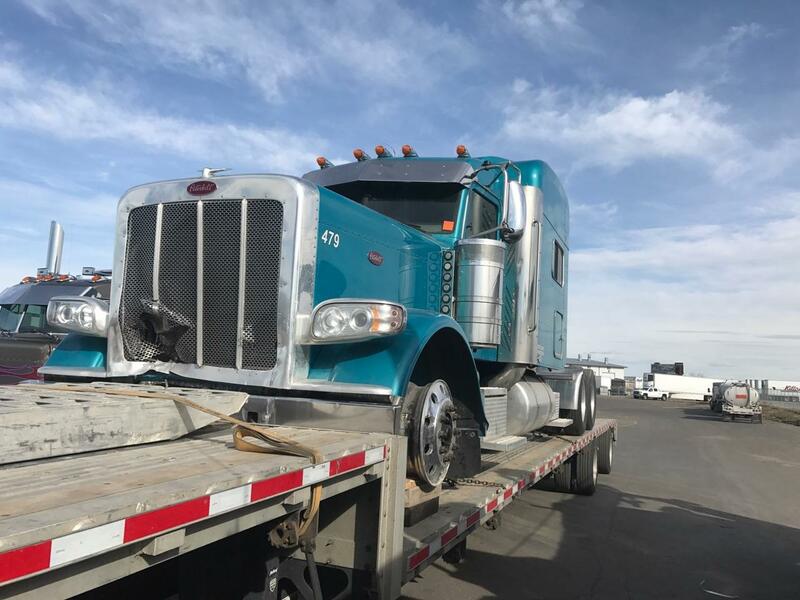 Once the shipment is tendered to us, we will handle all aspects of transporting the piece, and the charges will be included in one itemized bill. This makes records for the shipment easier to store and retrieve and keeps our customers focused on the crucial aspects of running their business, while we handle the dirty work. Below are three pictures of the process required to load salvage equipment or any inoperable machinery which could otherwise be driven on via ramps or a loading dock. For this process, an I-48 agent, Samantha, hired a wrecker that brought two units, stabilized via outriggers, who used their cranes to lift the tractor and deck it on the bottom deck of a 53′ step deck trailer. 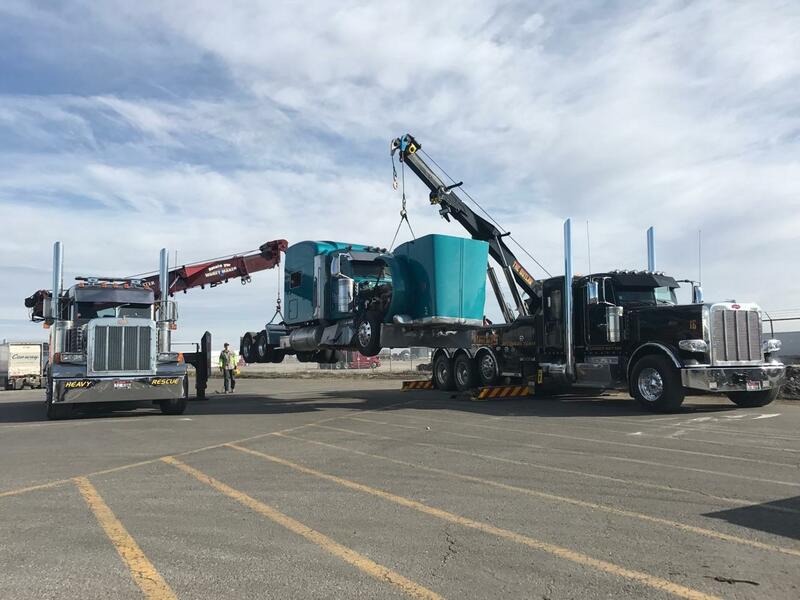 Prior to this, we had contracted with Idaho Peterbilt to remove the stacks which had rusted and rendered the unit over-dimensional for the height. Thanks to Idaho Peterbilt and Hendrickson Towing for the assistance. Once the machine was loaded and safely secured, the driver set off en route to delivery. Regardless of whether your equipment is new or used, in good shape or inoperable, we can coordinate the services required to get it from point A to point B. Call us today for estimates for shipping any salvage equipment you are looking to purchase or sell.